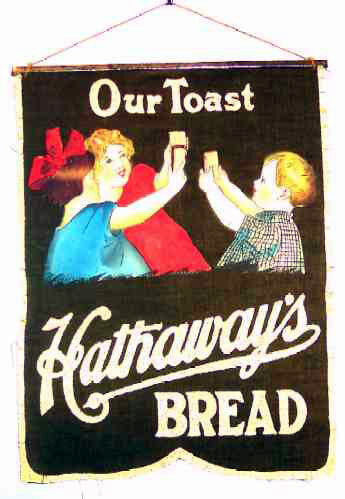 Advertising Pennant for Hathaway's Bread, dating to the turn of the century, perhaps a bit earlier. The ground is olive green velvet and the lettering, in relief, is dark gold velvet with glitter. The children are painted and the detail as well as the condition is excellent. The children are lifting their bread slices in a "Toast" to Hathaway's Bread. How cute is that? Hathaway's touted itself as "The best loaf for children". Size is 9-1/4 x 12".